Sometimes, throwing a dinner party hardly feels worth the trade-off of the subsequent cleanup. After all, dealing with piles of dirty pots and pans and a floor full of crumbs is no fun, especially if it’s past midnight and you’re already halfway to hungover. You could cut corners with easy-to-chuck paper or plastic dishes, but the real ones look and feel so much better. But the chaos doesn’t have to feel overwhelming if you go at it systematically. Here, seven tips for making it painless. 1. Don’t bring your garbage to the trash bag. Bring the trash bag to your garbage. Start by collecting all of the trash and putting it straight into a heavy-duty garbage bag. Scrape food scraps off of plates, chuck all of the dirty napkins, and collect all of the empty wine and beer bottles in a separate bag for recycling. As soon as you’re done, tie up the bags and take them completely out of sight. Then take a moment to savor your sense of accomplishment. I told you this was going to be painless! 2. Clean up the kitchen before bringing anything else in. An empty drying rack and clean counters are imperative before you begin the real work. So take some time to make sure all of the dirty pots, pans, and bakeware is clean and put away. 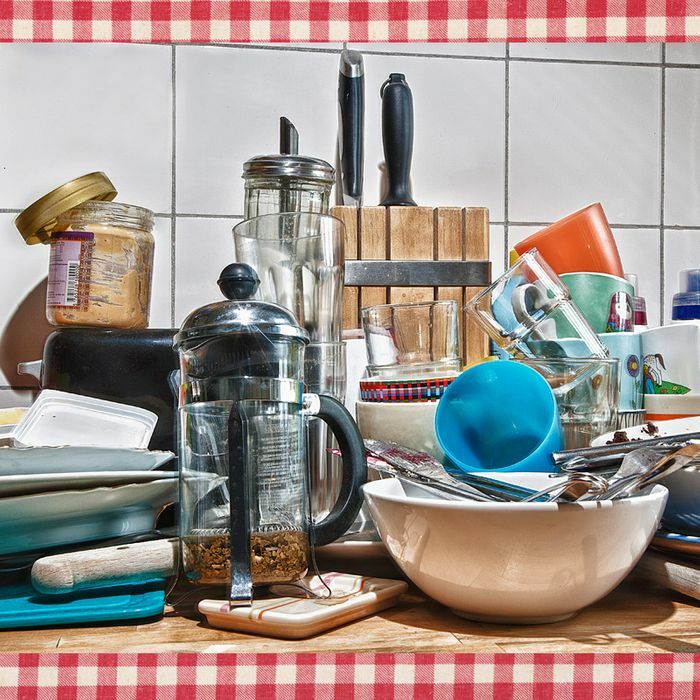 Dispose of any food remainders that may have made their way into your kitchen sink and give your counters a quick wipe down even though they’re about to get dirty again. 3. Collect the dishes by type and bring them to the kitchen to be cleaned accordingly. You’ll be able to create a nice flow if you focus on one type of dirty dish at a time. Pile up all of the plates by size, group all of the glasses together, and gather all of the silverware before heading into the kitchen. Then bring each category over to the sink one at a time, in preparation for dishwashing — and attack. The uniformity will also make loading up the drying rack easier and more efficient. 4. Soak the silverware while you wash the other dishes. Since your forks and knives will most likely be covered in stubborn food particles, a good soak will make washing them a whole lot easier. Place them right into a large bowl or dish filled with warm water and soap and let the suds work their magic while you conquer the remaining dishes. 5. Lay a towel out on your counter for extra drying room. Since the rack can fill up quickly and you may not have a pal to wipe down dishes, a towel can be used in the interim. Avoid putting glasses face down, though, since their insides won’t dry that way. 6. Get the common areas back to normal. Now that your party is over, you may need to shuffle around furniture, take leaves out of tables, or put some chairs away. Take care of this mess before you head to bed so you won’t have to deal with it in the morning. Tackle one area at a time and set small goals so you don’t get overwhelmed. Also, keep in mind that you’re almost there! Once you’ve completed your cleanup, take a few minutes to relax and admire the work you’ve done. You’re the ultimate host: master of both the prep and the subsequent mess.